All services include nail clipping and ear cleaning. 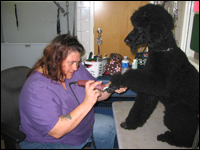 You may request your grooming service at the time that you check in for your pets’ stay. Between your pets’ kennel stays, we are always happy to keep up that fresh, clean look for your pet. We are open 7 days a week for your convenience. Call us at 716-688-2247 for an appointment. We offer a basic bath and brush (no nails or ears) Tuesday and Friday for only $19.00 while your dog is at Day Care. To take advantage of the offer, simply mention it to the receptionist in the morning when you check-in. Your pet will be fresh and clean when you pick them up at the end of the day.